Good Morning! Well, It feels a bit strange, here. For those of you who are new, I have just radically overhauled the look of my Blog! And, for those of you who have been with me for quite awhile, what do you think? 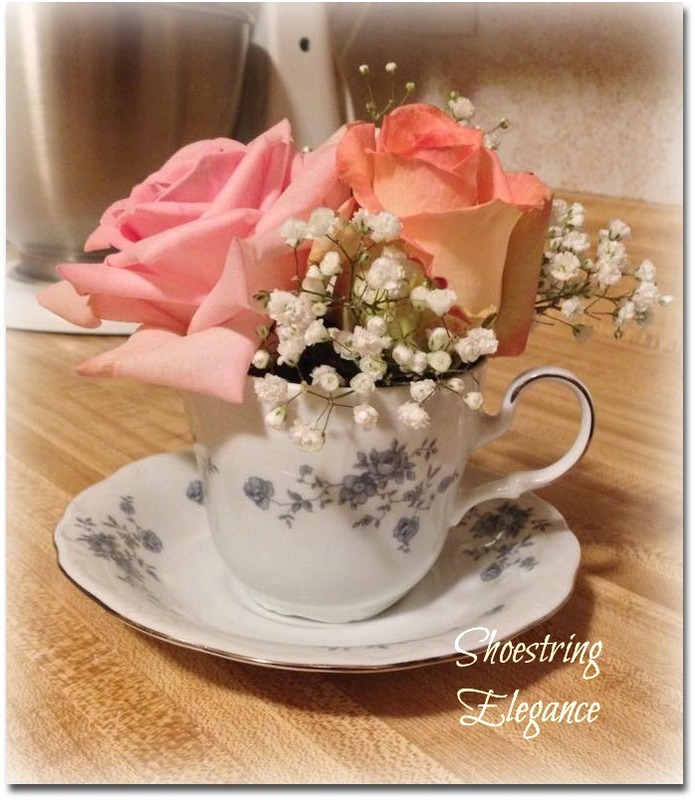 I have received more than a few comments and/or e-mails that Shoestring Elegance's "old" blog background was dark, and perhaps very difficult to read, especially for those of you who were viewing from Mobile devices. So, I dived in and changed to a lighter background with dark print. I'm feeling a bit like a fish out of water! Very new and different for me to get used to. With that said, I'm not sure I am done yet! The trials of being an OCD'er! I would love your feedback about the change. It is far more for your reading pleasure than for me, personally. None the less, today is a wonderful day! Yesterday and today I have been honored and Blessed with the task, of once again, handling Decor for my church's Baptismal Celebration dinner!! So once again with great pleasure, I got to play with roses, I mean, arrange some absolutely beautiful roses for the tables at the celebration dinner! Aren't they stunning? Who would not want to play, ahemm, arrange such beauty?!! Many Blessings to you all, and much gratitude for you taking time to come over for a visit! I appreciate you all so much! By the way, if you were wondering, the beautiful new header on my Blog was created by and offered free, from the extremely talented Linnea, at Vintage Made For You. .Good luck and keep up the lovely posts!! Thank you so much, Sally!! <3 Will try to! but roses always make me swoon. Thank you Marilyn. I'm so glad you enjoyed it! It looks fantastic Theresa! Very clean and easy to read. That is what I try for too. Where did you get that "Share It" Facebook and Twitter badge? I need something simple like that. I haven't ever paid anyone to overhaul my design I just learn as I go, tweaking along the way. Thank you Sherry I haven't paid for anything yet either. I'll get you the information shortly via email. Hi Theresa! I love how your blog looks, especially the header! How did you do that? I am in the process of changing my blog and am having trouble getting the wallpaper to show up that I downloaded. I may have to completely start over, blah! If you have any tips to share with me, please do so. Thanks for sharing! Blessings from Bama! Fellicia, It wasn't too hard, just a bit time consuming and a little tedious. Shoot me an e-mail and I'll be happy to share what I found out with you. There is a special code for centering those darn headers! I see nothing wrong with your blog. I am sure you will add other things to suit your taste. You are blessed to have so much talent for decorating so well. The flowers are gorgeous. Thank you so much LV!! I'm so pleased and grateful you took the time to come and take a peak! Cindy, Thank you so much! I'm so relieved and grateful to read that you like it, too! 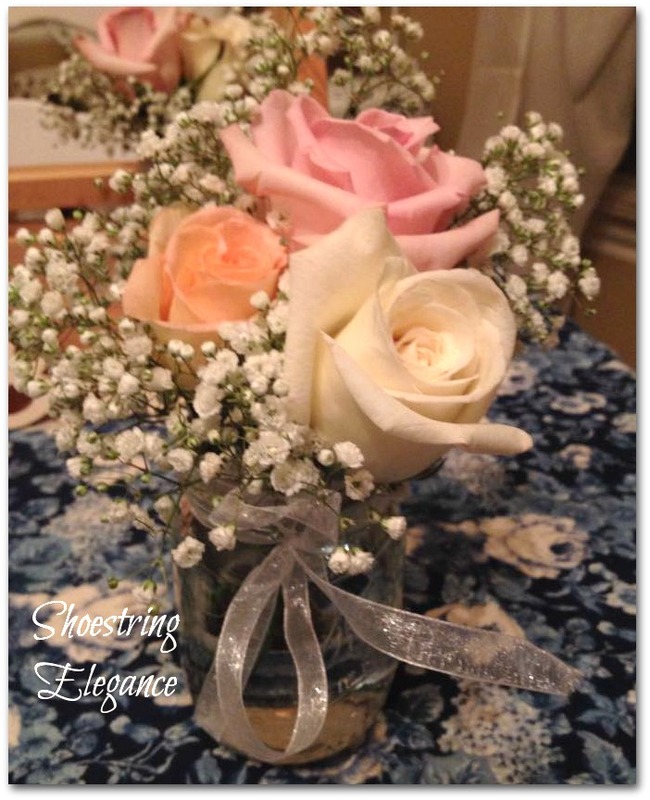 Yes, the roses were unbelievably perfect! 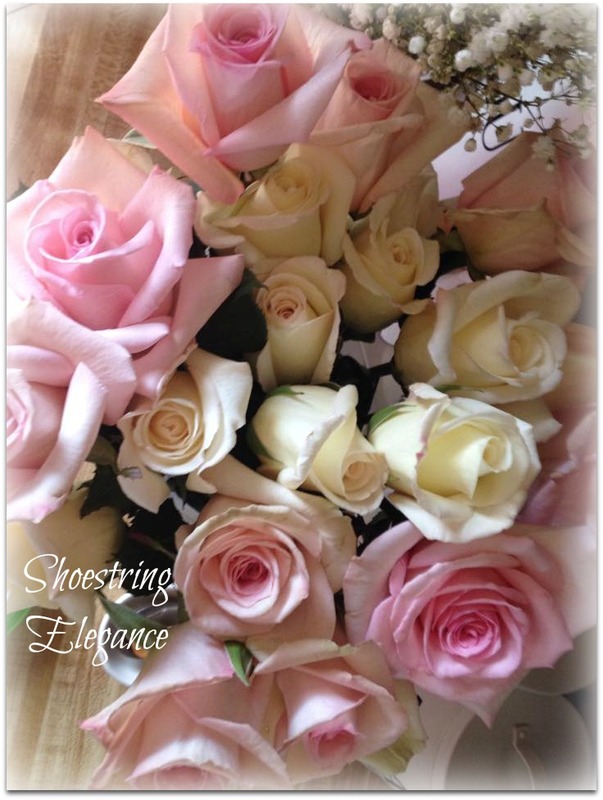 Ahhhhh Theresa Don't feel strange on this site..with the new look...Lady it totally FITS you and your content and your Blog Name: Shoestring elegance....Just RIGHT!! Theresa certain blogs[LIKE THIS ONE] when I arrive at the home page it just stops me in "my tracks"....I tend to breathe deeply a quiet peaceful sigh and soak in only peaceful feelings...it suggests quiet, peace, thoughtfulness, beauty ...girly ! okay, that says it..I LOVE IT. Jonell, You are so sweet. Every word you said is exactly how I hope people feel when they get here. I'm so glad you are pleased with it! Thank you so much for your wonderful words! I LOVE the new look! It is so much easier to read and it looks so fresh and vinatge-y. You did a great job! Thank you so much, Natasha! Such a scary process. So, I'm even more grateful than usual for your kind words! I am new. 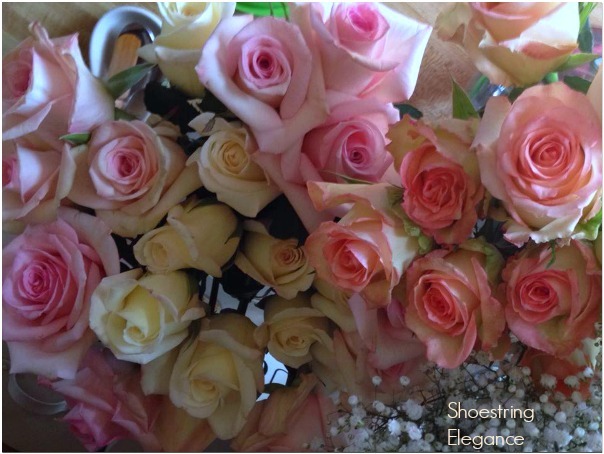 I think your blog looks fabulous and the roses are gorgeous. Thank you so much, Trish & Welcome! Thank so much, Katherine and ditto to you, my friend! I think the new look is great! Congratulations on making the change--it is much easier to read! And how wonderful that your header was free--what a lovely service!